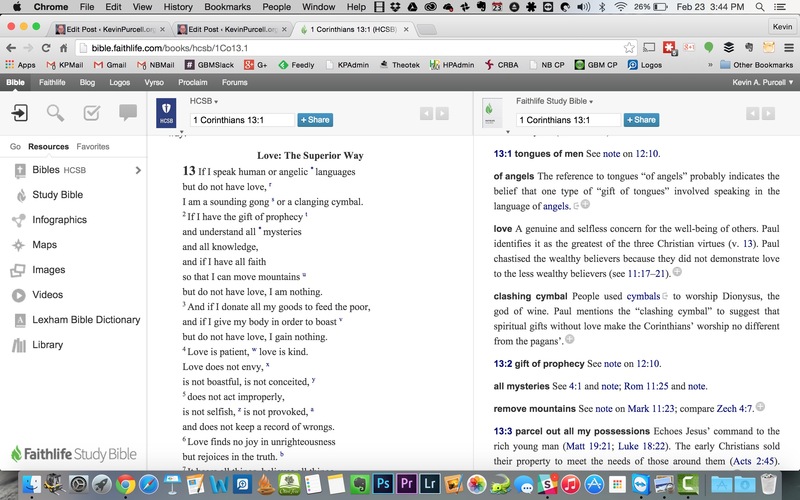 Bible study’s going online, not entirely, but increasingly so. So here’s the first three of my six best online Bible study websites that you can use on your new $200-$300 Chromebook that won’t run locally installed Bible software. They will also work great on the many of the new Windows notebooks or tablets that only come with 32GB of 64GB SSDs, like the HP Stream 13 I recently reviewed. With limited storage these computers can’t handle huge libraries from the complex Bible study programs like Logos, WORDsearch, Accordance or PC Study Bible to name some of the most popular. You can get a Bible app or stick with your computer and use one of these online Bible study sites. A couple of the more popular programs that run locally also come in online versions. So check out this list and maybe you can leave your complex and bloated Bible study software off that new Windows tablet or super-cheap notebook with only 32GB of storage. And you could do some study on a Chromebook, which doesn’t let users install advanced Bible study programs. We list these sites in no particular order. 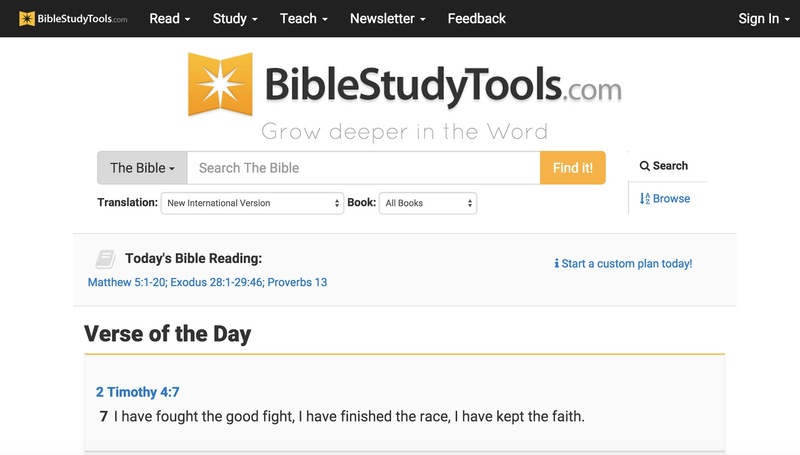 The first of our online Bible study websites is BibleStudyTools.com. What makes this a viable option for intermediate level Bible study software? Users can search the Bible, read it, track daily Bible reading plans and share scripture via copy/paste or links to post to popular social media outlets. Almost every online Bible can do those things. Here’s what this site offers in addition to the basics. The first of our list of online Bible study sites includes a number of modern and public domain Bible translations. There’s also some limited original language study. The site will collect user notes and highlights for those who sign up for a free account. The Bible student can mark up their Bibles and save their study findings for future reference. The Interlinear Bible in Bible Study Tools online Bible study site uses KJV and NASB as the English translation. While the site doesn’t offer as many modern reference tools, a user with simple needs can get a lot done. Read a text, highlight it and write observations in a note attached to a verse. Then open the interlinear Bibles based on the KJV and NASB to do some original language study. Search the text for some cross references related to the topics in the passage. This gives any Bible student a good start in understanding their passage. The Interlinear Hebrew text comes from Biblia Hebraica Stuttgartensia from United Bible Societies. The Greek text comes from Center For Computer Analysis of Texts, University of Pennsylvania based on Nestle Aland 26. After these early steps, open some commentaries, dictionaries or the ISBE and learn more about the passage and what others said years ago. Record those findings in the notes. Then find the passage’s Big Idea and come up with an outline using an online word processor like Google Docs or Office 365’s version of Word online. If I had to compare the site to a piece of Bible software, I’d say it can do almost as much as e-Sword with a few modern translations added to it. 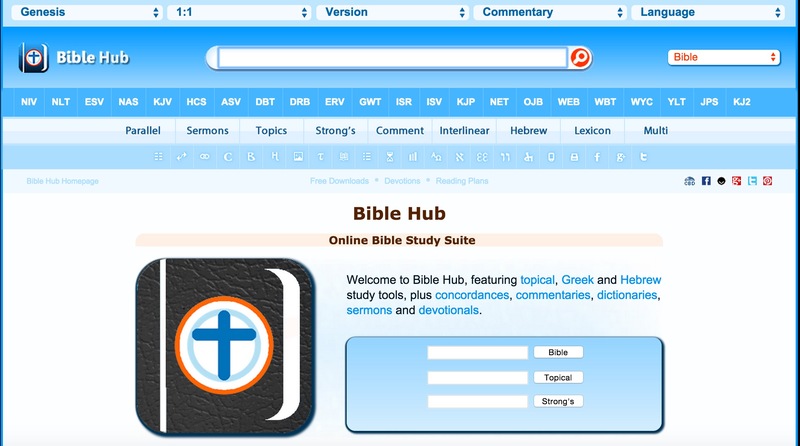 The next of these six best online Bible study websites comes from Online Parallel Bible Project in the form of BibleHub.com. The interface looks a little cluttered, but it’s still a useful site with plenty of resources. Enter a Bible reference in the top search box and the site opens the verse in all the translations and commentaries available in the left column. Along the right column we find some helpful tools like the context of the passage, cross references and Treasury of Scripture Knowledge. Across the top of the site there’s a toolbar that helps people navigate to specific passages in any of the supported translations. The site includes a large collection of modern and public domain translations. The toolbar also includes some public domain commentaries. Access them through drop down lists. The toolbar buttons put many of the tools a click away. 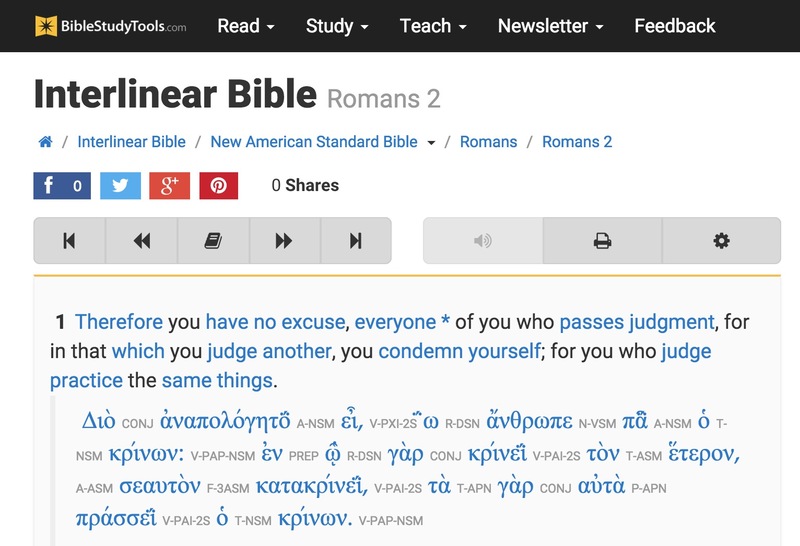 We get a parallel Bible button, cross references and a context button that shows the single verse within the pericope. In addition there’s links to a few specific commentaries and more. Like the other sites, Bible Hub lets me share to Facebook, Twitter and Google+. It includes some nice pictures, maps and outlines. 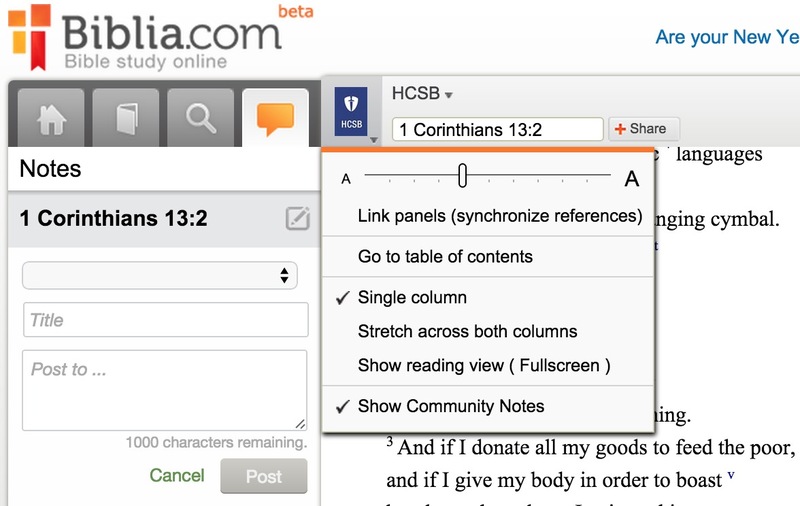 Logos Bible Software users will want to go first to Biblia.com. They also offer a pair of sister sites – library.logos.com and Faithlife Bible online. So why three sites? 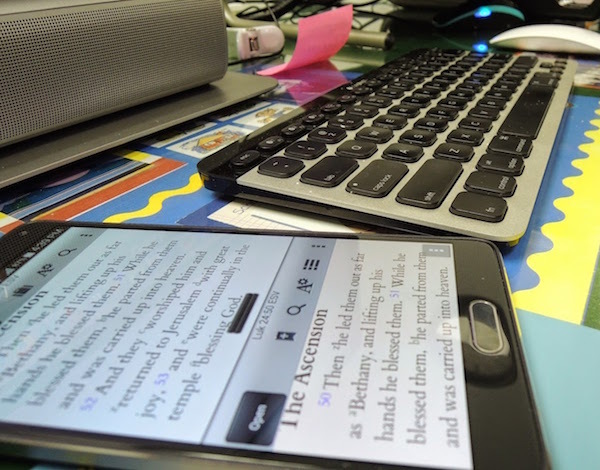 Library runs better on mobile browsers, like an Android smart phone or iPhone. Faithlife adds the company’s online study Bible focused social network and using the Faithlife Study Bible. The more pure online Bible site is Biblia. None of the three Faithlife sites do as much as our first two in this list, but they make a Logos Bible Software user’s library available online and as a group they offer a great selection of tools and features. The makers promise some more advanced tools “coming soon.” I’d be happy if they just integrated all of the features into one site. The main part of the Biblia screen includes two window pane. The user can open books in either side. For example, open a Bible in the center column and a commentary on the right. The two will sync up to the same verse when a user turns the feature on using instructions explained below. Use a mouse wheel or swipe on a laptop trackpad to scroll through the Bible from Genesis 1:1 all the way to the end of Revelations 22. Click the book cover in the upper left corner of the book’s window to show the settings. The sharing tool will let you post to Twitter or Facebook, get a link to the verse on Biblia.com to post online or email, and an embed code to post to a website. The library.logos.com presents the same basic tools as Biblia, with a few minor changes, in a mobile browser view. Surprisingly, this site, though optimized for mobile browsers, actually does a little more than Biblia. The Faithlife Study Bible online site presents the Faithlife Study Bible in online for and looks a little like the Faithlife Study Bible app on Android or iOS. We don’t get the Passage Guide, Text Comparison or the Bible Word Study tools from library.logos.com. See it below. I wish Faithlife would take all of these sites and streamline them into one great online Bible study site. It would make it the best of the six online Bible study sites in our roundup. Check back for part two of this roundup of the 6 best online Bible study sites. https://TheBible.life is a candidate for consideration also. Reading Plans, Calendars, Memory Games, bible verse flash card 3×5 maker, much more…all free.